Microgrid converters are required to have the capability of both grid-tied mode and islanding mode operation. For this dual-mode operation, large shunt capacitors are often used in the interfacing converter output LCL filter, as it can help to stabilize supply voltage and to reduce switching ripple pollutions to sensitive loads during autonomous islanding operation. 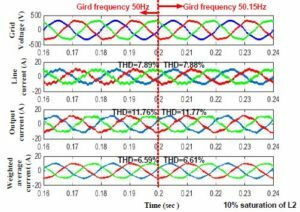 At the same time, this modification causes a few challenges, including the low frequency harmonic distortions, the steady-state tracking errors and the slow dynamic response, to the line current regulation during grid-tied operation. 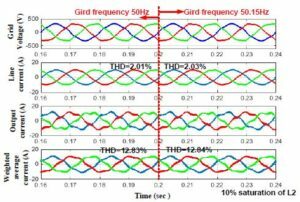 To overcome these drawbacks, a modified weighted average current controller is developed. 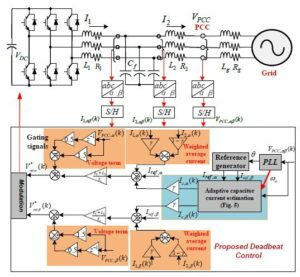 First, to realize a fast line current response, a deadbeat control of weighted average current is developed based on a reduced-order virtual filter plant. 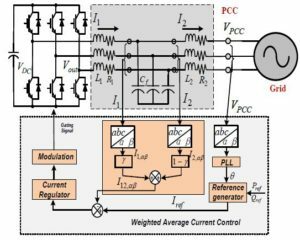 Second, a grid voltage feed-forward term is added to the weighted average current reference to mitigate the steady-state line current tracking errors. Note that this compensation term is directly added to the current reference, thus, it is very well decoupled from the closed-loop current regulator. 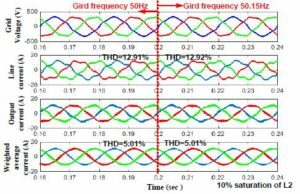 In addition, it can be seen that the low-order line current harmonics caused by grid voltage distortion is inherently compensated by this proposed corrective feed-forward control. Fig. 1. Diagram of a grid-tied converter controlled by conventional weighted average current feedback. Fig. 2. Diagram of the proposed control deadbeat scheme with weighted average current feedback and line current tracking error compensation. 1) In order to realize rapid control of converter current, the deadbeat control is applied to regulate the weighted average current based on a virtual filter plant. 2) The feed-forward compensator is developed to mitigate the steady-state fundamental current tracking errors caused by conventional weighted average current control. 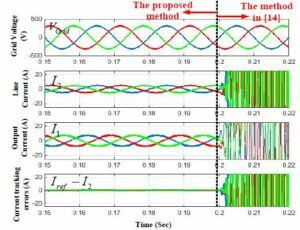 3) The frequency-selective capacitor leg current estimation is proposed and the corresponding compensation term can be used to increase the robustness of the converter against grid harmonic distortions. The design and implementation of this compensator are highly decoupled from the closed-loop deadbeat current regulator. Thus, both the current regulator and the compensator can be independently designed. Blaabjerg, Z. Chen, and S. B. Kjaer, ―Power electronics as efficient interface in dispersed power generation systems,‖ IEEE Trans. Power Electron., vol. 19, no. 5, pp. 1184-1194, May. 2004. Rocabert, A. Luna, F. Blaabjerg, and P. Rodriguez, ―Control of power converters in AC microgrids,‖ IEEE Trans. Power Electron., vol. 27, no. 11, pp. 4734–4749, Nov. 2012. 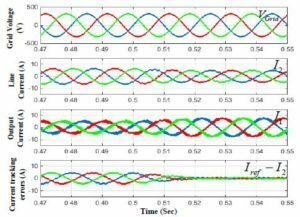 W. Li, D. M. Vilathgamuwa and P. C. Loh, ―Design, analysis and real-time testing of a controller for multibus microgrid system,‖ IEEE Trans. Power Electron., vol. 19, pp. 1195-1204, Sep. 2004. 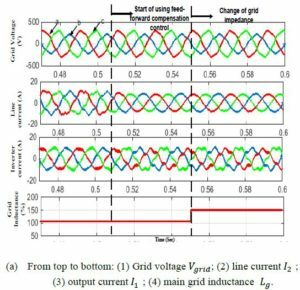 M. Guerrero, L. G. Vicuna, J. Matas, M. Castilla, and J. Miret, ―A wireless controller to enhance dynamic performance of parallel inverters in distributed generation systems,‖ IEEE Trans. Power Electron., vol. 19, no. 4, pp. 1205-1213, Sep, 2004.